← Cross Contamination? It Happens. The Aug./Sept. issue of Living Without magazine. 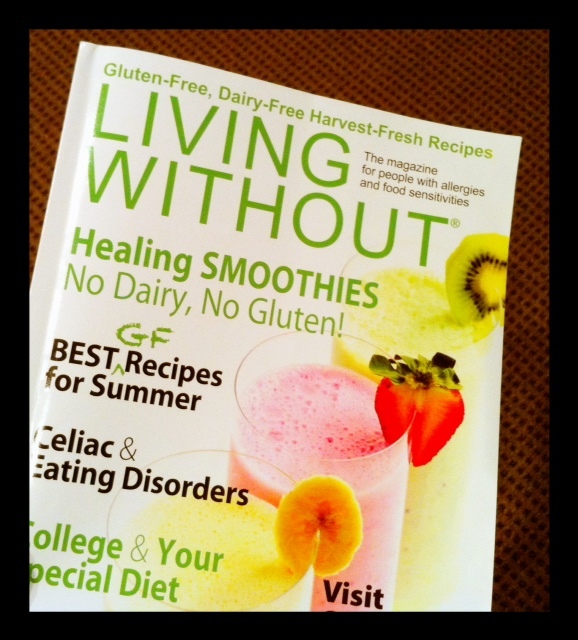 Who knew that the magazine, “Living Without” – could really empower you to living with HEALTH! It’s true that the best person to listen – is someone else who has been there. It’s so encouraging to read another’s struggle, and be comforted that someone else understands that without nodding while thinking…”you’re a head case”. While it took the husband almost 20 years of symptoms and struggles to get that “golden standard” diagnosis, his wife’s process was later in life, and easier to attain – given his struggle. Together, both being doctors – realized how wide-spread the levels of gluten intolerance are – and they wanted to be the voice in the medical community. They want it to be one of the first things doctors check out when they’re running down their “most common” causes of symptoms – specifically inflammation, of any kind. We definitely need more of that around! Interesting article about how some celiacs are upset with the gluten-light/fad dieting going on. 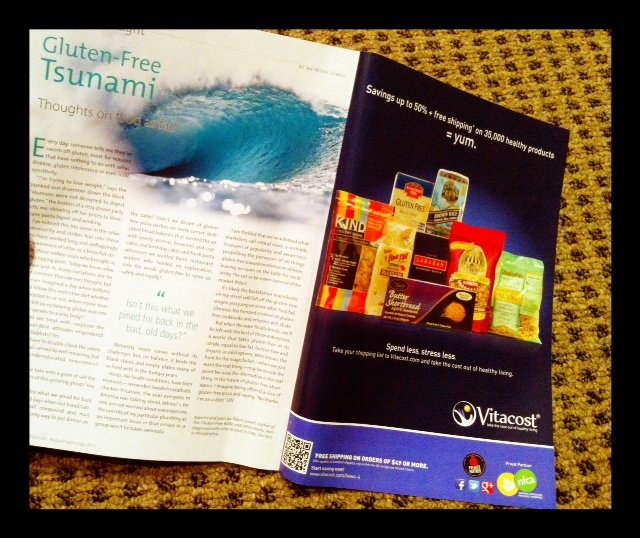 On the other side of the page, my favorite online store – Vitacost!! Living Without has some great information all over their website. You can sign up for a free regular emailing they send out with recipes and information as well as they share a quick start guide for those wanting to learn more about going gluten-free. They also have a special section for those who have children with ADHD, or learning disabilities and are looking at going gluten-free. I realize, some of these things can be expensive… and this can’t be an over night process for many – but having goals on getting well, and making change are helpful. Set your plan in motion! Posted on July 24, 2012, in Celiac/Gluten Sensitivity, Diet, Label Reading, Our Struggles and tagged celiac disease, gluten intolerance, gluten sensitivity, Living Without Magazine. Bookmark the permalink. Leave a comment.